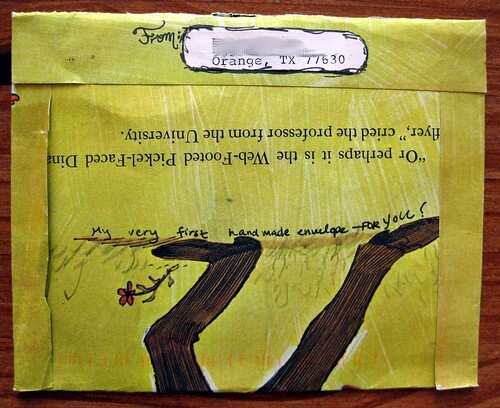 This has to be one of the cutest handmade envelopes I've received, from a blog reader in Texas. 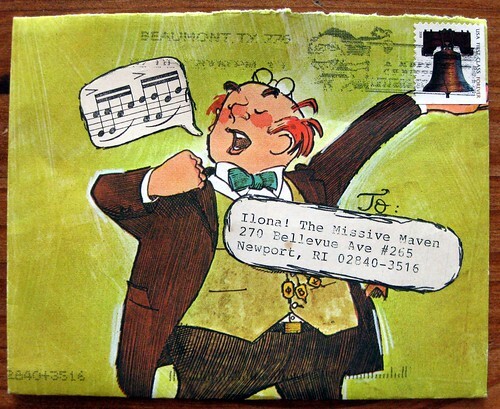 Can you believe it's her very first handmade envelope? She certainly starts on a high note! On another high note, I have been slammed with work lately, it's my crazy busy season - but today I am TOTALLY OFF. No work to do whatsoever! This means I can actually dig back into that growing letter pile. Dare I post my own letter-writing goal today? Probably not, but maybe I'll report some positive results later. Go write a letter! Sundays are great for that! Both my daughters are CPAs. This time of year is NUTS for them and they both end up working weekends, though usually not Sundays. I'm going up to Boston in March just so I can do some cooking for them and take care of the grandchildren for a few days. Oh wow is that not an awesome and very note worthy envelope . I love opera too so it hits a great chord with me . Hope you will excuse the pun dear . Have a wonderfull day and week . That is one incredible envelope!